You can take the animal out of the jungle…and put them in a seaplane. Higher for Hire in the city of Cape Suzette. Disney tasked Jymn Magon and Mark Zaslove with coming up with a new animated series. They were stuck for an idea until the theatrical re-release of Disney’s The Jungle Book hit theaters, inspiring them to make a show around the character of Baloo (Phil Harris in the film) and incorporate all the characters. TaleSpin cast: Louie, Wildcat, Baloo, Kit, Molly, Rebecca, Khan, and Air Pirates Don Karnage, Gibber, Mad Dog and Dumptruck. They updated the setting from the jungle to the fictional city of Cape Suzette, which was set in a fictionalized version of the 1930s, with the primary form of entertainment coming from radio programs. 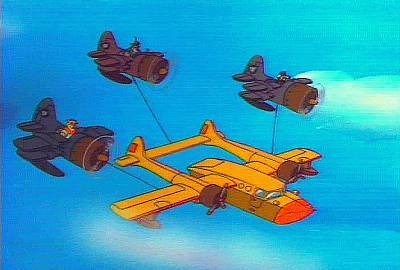 The manga Hikotei Jidai inspired them to make Baloo (Ed Gilbert) a pigheaded seaplane cargo pilot who often encountered air pirates, led by the egotistical Don Karnage (Jim Cummings, using inspiration from Desi Arnaz’s Ricky Ricardo). Cheers, the most popular television show at the time, led to the creation of Rebecca Cunningham (Sally Struthers) as an ambitious, yet inexperienced, manager who took over Baloo’s business and became his boss and influenced their relationship dynamic. Casablanca saw the creation of Louie’s Place, an island neutral zone where everyone could gather for a respite with Louie (also Cummings) taking the place of Humphrey Bogart’s Rick. Late in the show’s development, it was decided to add Shere Khan (Tony Jay) as a ruthless businessman whose schemes often led to paths being crossed with Baloo and his friends. Looking to keep the impressionable son/bad father dynamic prevalent in the film, they replaced Mowgli with new character Kit Cloudkicker (R.J. Williams & Alan Roberts); a young cub who was Don Karange’s protégé until he decided to quit the air pirates, meeting up with Baloo and becoming his navigator. Other characters included Rebecca’s daughter Molly (Janna Michaels), and their mechanical genius (though ultimately clueless) mechanic, Wildcat (Pat Fraley). The Sea Duck at the mercy of the air pirates. After a preview run from May 5-July 15, 1990 on The Disney Channel, TaleSpin officially began that September with the television movie “Plunder & Lightning”. The movie saw Baloo meet Kit and lose his business to Rebecca. 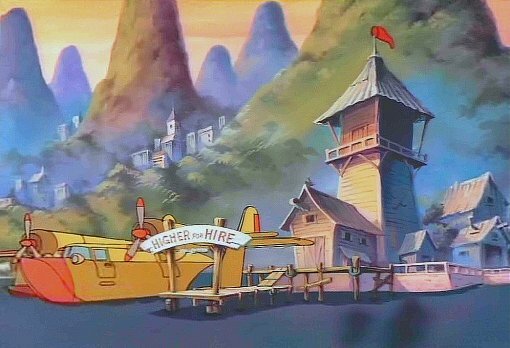 Baloo stayed on as a pilot for Higher for Hire after Rebecca paid to rebuild his plane, the Sea Duck, after it was destroyed saving the city from the air pirates. The film was the only nominee for an Emmy Award for Outstanding Animated Program in 1991 and was later broken up into four episodes for syndicated reruns. The series followed Baloo on his adventures that came with his deliveries and schemes to get rich and get his plane back, often finding him at odds with the air pirates, the nation of Thembria (loosely based on the Soviet Union) or Shere Khan. The show ran for 65 episodes on the syndicated programming block The Disney Afternoon. It remained there until 1994 before returning to Disney-owned cable channels for further reruns, where episodes were extensively edited due to their content such as instances of terrorism, particularly after 9/11. When the series was finally released to DVD, however, the original syndicated episodes were restored.